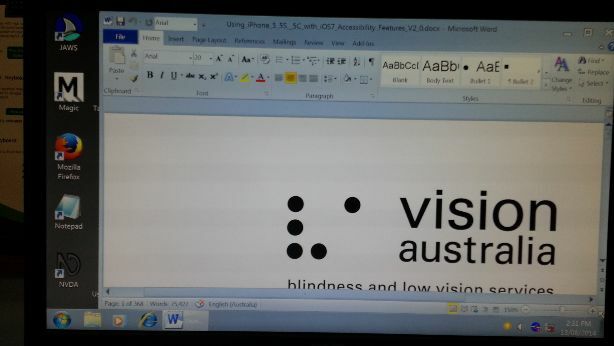 Setting up Windows for low vision on a PC: Screen resolution vs DPI | 22 Point Blog! I thought I’d step away from Android this time around to take a seat at my PC to cover setting up Windows for low vision, and in particular, the confusing difference between adjusting Windows’ screen resolution, and changing the DPI settings. The quick recommendation: In short, set your resolution as high as possible, your DPI as high as practical, and if needed, use a full screen magnifier (such as the Windows magnifier) to make things bigger again. Screen resolution is how many pixels wide and high your screen will display – eg a resolution of 1920×1080 has 1,920 pixels from left to right and 1,080 top to bottom. 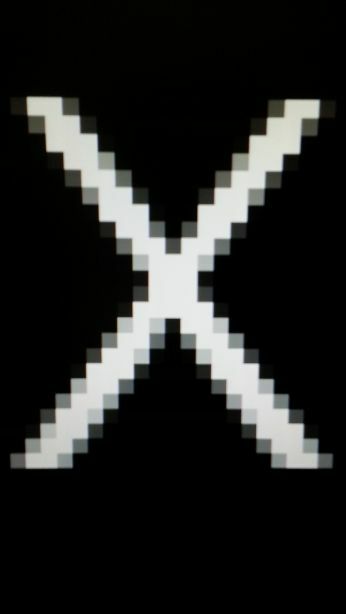 Each element on the screen (icons, text, the clock for instance) is generally a certain number of pixels high, so if we go into Microsoft Word and type the letter X (at standard dpi for now) in Arial 12pt font and then zoom in using the magnifier (or a handheld magnifier even), it is possible to distinguish that the letter X is actually 12 pixels (little squares) high. At higher levels of zoom that becomes increasingly noticeable and letters appear blocky or ‘pixelated’. 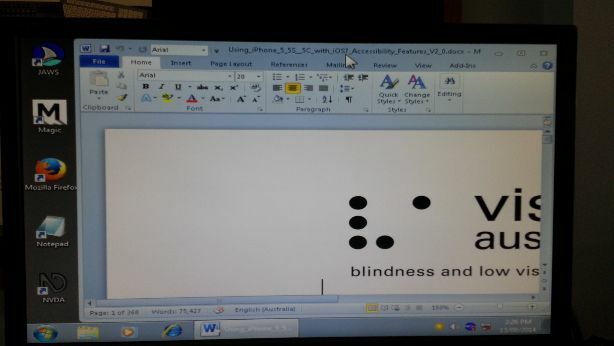 At a resolution of say 800×600, your 12pt letter ‘X’ takes up 2% of the height of the screen (12 pixels into 600 high). If we change the resolution to 1600×1200 (just to make the calculation easy), your letter ‘X’ appears smaller on screen as its 12 pixels are now only 1% of the height of the screen. This is why screen manufacturers encourage you to set the screen to higher resolution, as everything is made up of smaller pixels and so looks smoother. The problem for those of us who can’t see so well is that it makes everything smaller in the process. So, on to DPI: DPI stands Dots-Per-Inch, which refers to how many dots actually appear in a physical inch of screen space – the higher the value, the closer dots are crammed next to each other and the smoother the edges of fonts and images will appear. If you get up close to your (older, analogue) TV with a magnifying glass, it is easier to see the individual pixels which make up the image than say on a new, high definition TV or computer monitor. Windows has the option to manually set the screen resolution and DPI (up to a maximum of what the hardware can display). What this means practically, is that if you use a larger than standard DPI, say “custom 200%” – every pixel now becomes four (each pixel high doubles height to two pixels high and doubles width to two wide) – so our 12pt ‘X’ is now 24 pixels high and so looks similar to how a letter ‘X’ in 24pt would look at Standard (100%) DPI. In Word you can easily adjust the font size in a document (if you display text in 72pt font the letters will be nice and smooth…. But very large so setting out and accurately printing documents will be hard and require extra work), however you can’t adjust the font size in the ribbon icons or taskbar clock or other places as easily, so using a higher than standard custom DPI makes these things look smoother when you zoom in with a magnifier. 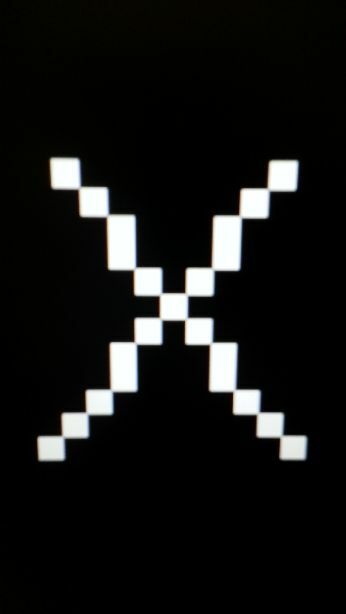 Our ‘X’ at a resolution of 800×600 and a standard 100% DPI, being at a fairly low resolution, will look somewhat pixelated. If we jump to 1600×1200 resolution (everything will be half the size it is now), but use a custom 200% DPI (everything doubles back in size again) – the end result is that everything should be a similar size to previously, but made up of twice as many pixels so should look much smoother. Images of 1920×1080 at 200%dpi (left) and 800×600 at 100%dpi (right). The sizes of many elements of the screen are not considerably different, however when we zoom in with Windows magnifier (see screenshots below), there is a marked difference in the quality of the way everything appears. Image of a closeup of our individual X as it appears at 100% dpi (left) and 200% dpi (right) – the height difference in the letters is just my inaccurate photography skills showing through! Note that many monitors won’t actually have a resolution of 1600 x 1200 exactly and depending on the exact width to height ratio (and exact size of your monitor), things may look slightly taller or flatter at different resolutions. Windows will let you use a custom DPI up to 500%. I just tried that on my 1920 x 1080 monitor and it enlarged everything way too much – I could fit five icons wide by two icons high on the desktop for instance and I could see about three items in the start menu, so I wouldn’t recommend using that 500% DPI setting unless you have a monitor with REALLY high resolution, as you will lose too much and I found for instance on my monitor at 1920×1080, 200% dpi worked ok and I could then use the Windows magnifier to zoom in further. Finally, everything I’ve stated above is around using the settings within Windows to tweak how the software displays things. Screen manufacturers usually have a specified “recommended” resolution for their monitors, which is often, but not always, the highest available. They claim this mode works best in terms of clarity and often you will probably find this is directly proportional to the true pixels per inch the monitor hardware displays. 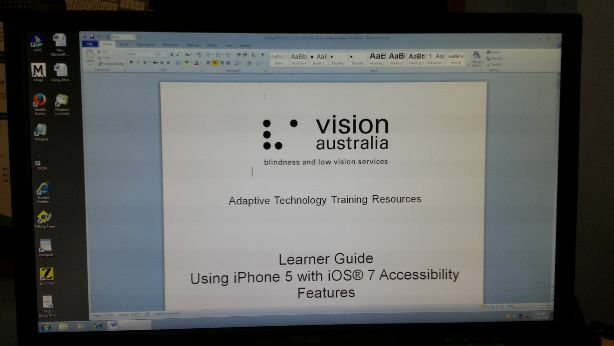 I would recommend setting the resolution to the recommended / highest, set the DPI to 200%, consider lowering the resolution back if only a small amount of enlargement is required (and it doesn’t impact on fitting everything on the screen), otherwise use the Windows magnifier and if greater flexibility in magnification is required, consider of the commercial programs. Hello Tomáš, I guess that ZoomText or SuperNova cope with Direct X applications better in Widnws 8.1 than in Windows 7 or earlier. So I would recommend to try ZoomText in Win 8.1. MAGic: From the MAGic 12 release notes: “DirectX 9.1 display adapters with the WDDM 1.0 driver or later are supported by MAGic 12. DirectX 10 or later is recommended.”. Supernova mentions that for Windows 8 it needs “direct X 9.1, WDDM 1.1 compatible GPU”. Also in terms of free options, the other one you might consider is GlassBrick: http://www.glassbrick.org/ I can’t see anything relating to DirectX, but I’ve talked to the developer previously and he has experience in the games and video graphics industry so has put a lot of effort into the quality of the display and has likely considered how it works with DirectX apps / games. Personally I prefer to change the resolution. As you point out using a lower resolution or using a higher resolution and increased DPI do not produce the same results. In my experience the higher DPI makes the stroke thinner but clearer and adds more space between icons and some icons appear smaller than with a low resolution. Your solution is to then use screen magnification software. I personally don’t want to use screen magnification. I want to see the whole screen at once without having to scroll to see parts of the screen that are outside of the magnified view. Honestly the pixelated low resolution doesn’t bother me and with my vision I really can’t see that pixilation. To date I have been able to stick with 800×600 resolution for the last 12 years and work much more effectively with that. At some point when I move to Windows 8.x I’ll have to move to 1024×768 — but I’ll likely solve that issue by going to a larger monitor. OS X also permits me to use 800×600 although some apps like Xcode require for horizontal space that require higher resolution. Additionally, I find a 4:3 standard monitor size to be preferable over a widescreen monitor. when users with low vision look closely at a monitor the field of view is limited do to the angle and thus a 4:3 aspect ratio works best for many of us. Hi Jonathan, good points. I too prefer the 4:3 aspect ratio over widescreen 16:9. With the resolution / DPI, one factor which often presents itself is the limitations of your hardware (and software, particularly if you haven’t setup the latest manufacturers drivers, not default Windows drivers, for your graphics card and monitor). Another is the programs you use – if you use something which pushes everything off the screen at less than 1280×1024, then it might not be useable at 800×600 or even 1024×768. Plus of course, as you said – my suggestion of using a higher DPI and higher resolution was partly around everything looking sharper at the higher resolution, but there’s no point in making other sacrifices for that if you don’t even notice the extra clarity anyway. I must admit, I am in the same situation in that I really don’t notice it myself. It’s a much more complex issue than it appears as first, thanks for your input!